From time to time, we’ll get asked if we sell Ash Trees. And while we’d love to be able to provide Ash Trees to the public, the risk with the emerald ash borer (EAB) is simply too great. That being said, we wanted to share some general information, as well as the latest news about the Emerald Ash Borer’s status in Indiana. Discovered in southeastern Michigan near Detroit in the summer of 2002, the Emerald ash borer, Agrilus planipennis Fairmaire, is an exotic beetle that is responsible for the destruction of millions of trees. The painful irony was that it was reportedly accidentally brought to America in the ash wood which was used in shipping materials. Emerald Ash Borer kills ash trees as its larvae make their way through the wood that supplies the tree with water and nutrients. Even large trees that look otherwise healthy can succumb to and perish from Emerald Ash Borer in only 3-5 years (and in some cases, less time than time). Signs of infestation can be very subtle at first and typically once you’ve noticed a problem with Emerald Ash Borer, it’s already too late to save your ash tree/s. As it stands, the Emerald Ash Borer is still alive and well in our region and the United States as a whole. Your best bet, if you catch it early enough, is to provide your ash trees with injection treatments. 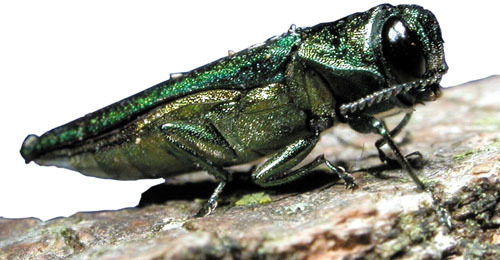 A systematic insecticide plan can provide 2-3 years of protection against the Emerald Ash Borer. Purdue University has a very helpful site where you can find out what you can do to preserve ash trees and if the Emerald Ash Borer is in your neighborhood. Unsure if the Emerald Ash Borer is in your area? For a list of quarantined areas, click here.